Yesterday was officially the first day of summer! Woot! It has finally cleared up here in Kansas and is starting to actually feel like summer! So in honor of summer I'm sharing my summer bucketlist! 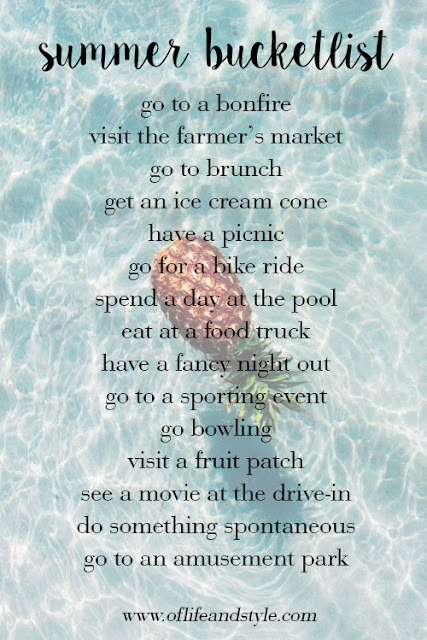 Summer is the perfect time to do new, fun and exciting things! I'm determined to make this summer the best summer ever. Last summer was pretty hard to beat, but I have a feeling the summer of 2015 is going to be the best one yet!